Are you a gmail user? 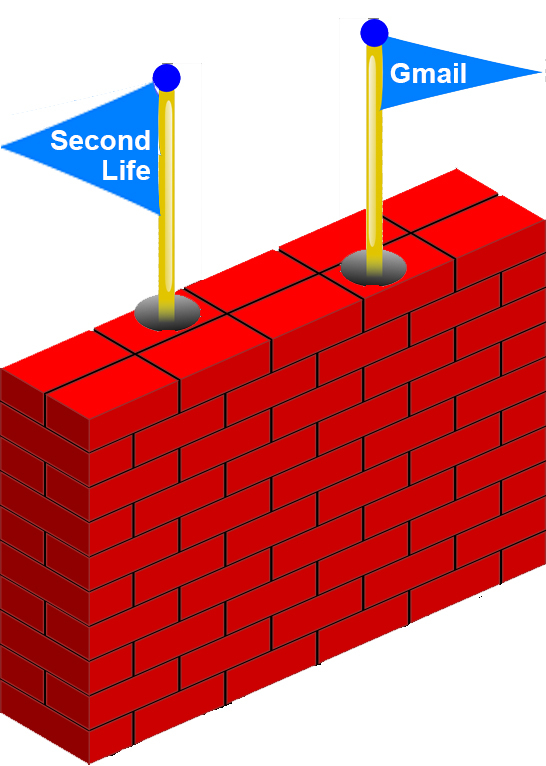 Have you seen your messages from Second Life decline over the last few days? There’s a reason for this – and you need to do something about it – NOW! It seems that a few weeks ago, Linden Labs was put on the SPAM list for gmail. Because of this, many of your offlines from Second Life may have been going to your spam folder (a peek into the dark recesses of your spam folder will confirm this – and I’ve included instructions below for how to check spam on the web). If you still wish to see all your offlines – and I know many businesses depend on this for customer service – you may need to set a filter. Pull up your gmail and go to the little settings *wheel* in the upper right corner. Click on CREATE NEW FILTER. It will bring up a new window. Your filter is now set! That’s the important one – you can also add a filter for no-reply@lindenlab.com too. If you want make sure all your offlines have been seen you can double check. Slowly lower your mouse down from the INBOX until the MORE option shows. You can now see everything in your spam file. If there is nothing there you care to keep, do not worry about it! gmail deletes all spam after 30 days! Many thanks to Melody Regent of Regent Estates for this information! Please spread the word as widely as you can! Previous Post: Celebrate the Season with the new issue of Prim Perfect! Next Post: Have you voted for your choices in the Huntie Awards? This is a very good tip. I just opened up my spam folder to find over 70 messages that had been miscategorised by Gmail – all from @im.agni.lindenlab.com – thanks for the heads up. When I go home, I’ll reblog it too. Thank you for the tip. Personally, I’ve set my filters somewhat differently (they do the same job), but I think your advice goes one step further. I think I have to remark here that, while setting up a filter to keep your SL emails from going to spam is a really good idea, this post seems to imply that Google is intentionally marking any or all email from SL as spam, which is not the case. Gmail’s spam filters operate, by and large, from user input. Either enough people have marked SL email as spam, or enough spammers are using SL’s email domain as a forgery, or unrelated spam is being identified as spam because of similarities in text or layout or subject matter. While is certainly could be done, I’m dead certain no one at Google purposely flagged the SL servers as spammers. I’m sure it’s not a deliberate choice by human beings at Google either – and I honestly can’t see how I was meant to be implying that in this post. Clearly, something triggered something – one switch clicked against another – and a global change happened. However, for many people offlines are now being flagged as spam and people need to be alerted. You pointed out something really important that perhaps eludes the attention of many people. Gmail’s filters (which are in no way infallible, as I have experienced false positives quite a few times in the past) are adaptive. They learn from what we routinely delete without reading and from what we report as spam. Receiving offline IMs in our emails is opt-in and, AFAIK, not enabled by default. So, it seems that a large enough number of SL users that have Gmail accounts routinely classified as spam offline IMs they chose to receive in their emails. If that is the case (and it most likely is), then I shall rest my case. I’m curious about how widespread this is. It hasn’t happened to me. Thank you very much!!! I was wondering where all my messages had gone! Actually hadn’t happened to me yet, I’ve been getting all the usual mail HOWEVER very appreciative of the tip and have implemented it. Thank you so much, I didn’t realize how much I had been missing lately! I will say that I did pass this along to Linden Labs and let them know, and as far as I have been able to see, there has been nothing posted to their website about it. One would think this would be a high priority for them. I even spoke to a Linden about the issue when we were looking to see what the issue was and not a word was said about it. I was told to check that my IMs offline were on and my email was correct. That was as far as they seemed to want to help. I am pleased to see this is spreading like wildfire and helping so many people out! Thank you so much for keeping the information going! Thank you so much for sending the initial message to the Regent Estates group – which is of course where I picked this up! Great article, I noticed my IMs and other messages from the marketplace started to end up in the spam folder and although I use the filters a lot, it never dawned on me to put up a “not spam” filter. OMG how greatful I am for this post! Thank you so much Prim Perfect! I found nearly 30 IMs in my spam folder. I depend highly on the offline IMs to my email, and we were just talking about this, that we have noticed a reduction… now I know why. Sending you the biggest huggiest hug ever! This is probably due to gmail users marking mail as spam from groups that work around and ignore the SL preferences that restrict group notices being sent as IM (looking at you Burning Man). As a matter of course, when I create a filter, I tick “not spam.” I learned that one a few years ago. I haven’t noticed this happen to me, but I’ve followed the above instructions all the same. Thank you for providing them.